Pink Lemonade: NEW product from Chiquita! Fresh fruit is the perfect snack during the hot summer months but eating it on-the-go can be messy and many fruits aren’t portable, which means it is not always easy. 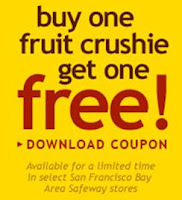 Now, San Francisco area snackers can enjoy two servings of real fruit in the convenience of a portable 8 oz. bottle. The new Chiquita Fruit Crushie is a 100 percent fruit snack that tastes as satisfying as biting into a ripe piece of whole fruit. 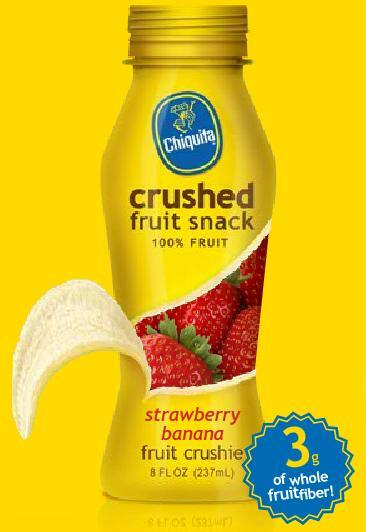 With the Chiquita Fruit Crushie, snackers can enjoy the goodness of fruit every day, without having to wash, peel or core. The naturally sweet Chiquita Fruit Crushie is made from the highest quality and freshest fruits available, with no artificial colors, preservatives or added sugars. It will satisfy your cravings with four juicy blends, including Strawberry Banana, Blueberry Banana, Mango Banana and Pineapple Banana.